One of the most controversial figures in the History of the American West is George Armstrong Custer. 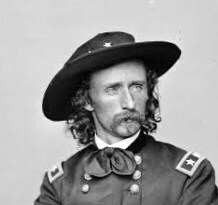 Often referred to as `General' Custer, his brevet rank during the Civil War, he was actually a Lieutenant Colonel when commanding the 7th Cavalry at the famous battle of the Little Bighorn on 25 June 1876. Custer's total force amounted to 667 soldiers, scouts and civilians. Underestimating the Indians - it is now believed there were about 1500 warriors, mainly Sioux, some Cheyenne and a few Arapahoes, although some estimates give much higher figures - he made the fatal error of splitting his force into three non supporting groups, his of 200 plus being completely wiped out. Total losses were approximately 253 soldiers and civilians killed plus 53 wounded. These are minuscule figures compared to what has happened in other conflicts but created a sensation at the time and has led to a huge literature, many films and continuing controversy to this day. The 7th cavalry gained their revenge over the Sioux at Wounded Knee Creek on the 29 December 1890 killing 128 Lakota Sioux, including women and children, with 33 more Wounded. It was not the one-sided battle often portrayed as 25 soldiers were killed and 35 wounded, the 7th Cavalry's biggest loss other than at the Little Big Horn. George Armstrong Custer. A2 Waterford Rough 140lb (300gsm). I first made a pencil drawing using a Pentel 205 mechanical 05 2B pencil. I then painted the features using various combinations of Cadmium Red Light, Yellow Ochre and Cerulean Blue. I avoided hard edges other than on the right facing side of the face. The hat is a mixture of Indigo (Daniel Smith) in various dilutions with some Cerulean and the hair a mixture of Raw Umber, Raw Sienna, Gold Ochre and a little blue. His coat is Cerulean and Cobalt Blue with the bow and buttons a mix of Raw Umber and Gold Ochre (W & N). Possibly I've missed out some Quinacridone Gold (DS). Custer was played by Errol Flynn in the historically very inaccurate movie `They Died with Their Boots On' - a typical Hollywood distortion - and I keep thinking my painting looks rather like Flynn! Usual brushes currently the Isabey Kolinsky sables including retractables sizes 4 to 8 and the Da Vinci Artissimo 44 No 2 mop - roughly equivalent to between a 12 and 14 round. This was the subject at the latest Avon Valley Artists session when once again I failed to take my camera, not deliberate I hasten to add. I was annoyed with myself at this latest lapse. There were fifteen members present and the subject lent itself to a wide variety of interpretations. I can only show you mine but I'm sure you will see Yvonnes on her website. www.floralwatercolours.blogspot.com/ Her painting, very accomplished as usual, is of dandelion heads with the seeds floating away as they do. This is the painting below in monochrome. After getting a mild slap on the wrist over the lack of darks (value) in my original Iris painting I thought it might be of interest to publish monochrome versions of the paintings. The biggest problem in assessing value in colour is that what you might think is dark isn't necessarily so, or probably better described as applying values to colours. I hope this will prove of interest. I'm unable to show the original photograph for copyright reasons but will describe it. Essentially it was similar in composition to the finished painting but with a solid black background and a large number of water splashes at the bottom part, which show up well against the dark colour. I decided to ignore this and go for a colourful approach heavily influenced by the Dutch master Gerard Hendriks, who I am pleased to call a friend. I first made a pencil drawing, paying particular attention to the head but with only a basic outline for the rest. The intention was to make an impressionistic and colourful image of the bird, having caught a small fish, rising from the river. There is an element of abstraction and could be described as my take on the `Realistic Abstract' theme of Keest van Aalst. With the glorious colours of the Kingfisher my colourist tendencies were given full reign. I painted the head first of all and did this with the small Isabey retractables. The colours are as described later except the eye was Ivory Black (Maimeri). The orange is principally Transparent Orange (Schminke PO71), a glorious colour, and although it isn't obvious there are also touches of Transparent Brown (Schminke PBr41) in the darker areas. The blue is mostly Turquoise (Lukas PB16) with some Cerulean. This Lukas colour is another star. The background colours allowed to mix on the paper, include Transparent Orange, Transparent Brown, Cerulean, Cobalt Teal Blue (DS PG50), purples mixed from Quinacridone Rose (Graham PV19) and Ultramarine Blue, Hansa Yellow Medium (DS PY97). I think that's it! I also splashed the same colours directionally to give the impression of the bird rising from the water. Finally, although not very evident. I splashed Vallejo Acrylic Gouache, slightly diluted, over the bottom area near the bird. This is useful stuff but beware - very messy! My brushes were restricted to the Escoda and Isabey Kolinsky retractables sizes 4,6, 8 and 12. This is another of the artists I first became aware of in Kees van Aalst's popular book `Realistic Abstracts` (Search Press 2010). Apart from his portraits, which are more impressionistic, most of his other work is of an abstract nature with small areas of realism - which is why Kees van Aalst featured him in the book. 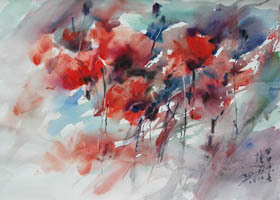 Although watercolour seems to be his major medium he also uses pastels and acrylics. 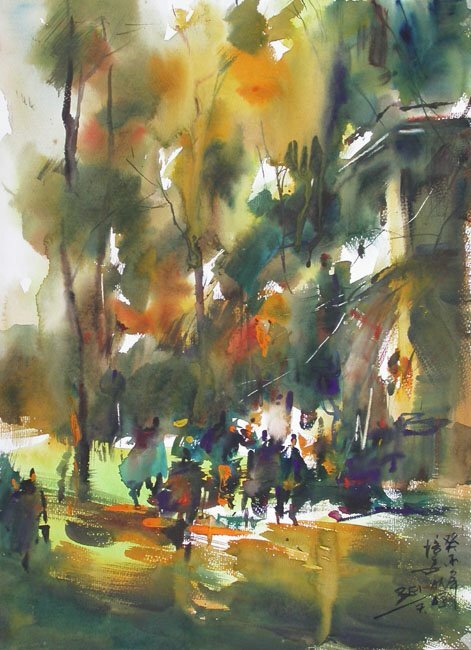 Many of the details that follow are from the literature that accompanied his 2013 workshop at the Moulin de Perrot Academy of Fine Arts at Gilhac-et Bruzac France. This is where Viktoria Prischedko also holds workshops. 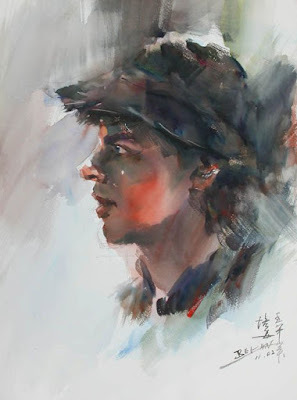 Bei-An Cao was born in Shanghai in 1957. He graduated from the Academy of Fine Arts in Shanghai and subsequently held a number of academic posts in several art institutions. He moved to Brussels, Belgium to study at the Royal Academy of Fine Arts from where he graduated in 1998. He also attended other faculties and currently teaches at the Watercolour School at Namur. Many of his works are in collections of professional painting in numerous countries including China, the U.S., Japan and various European countries. He has won many awards in both Europe and China. 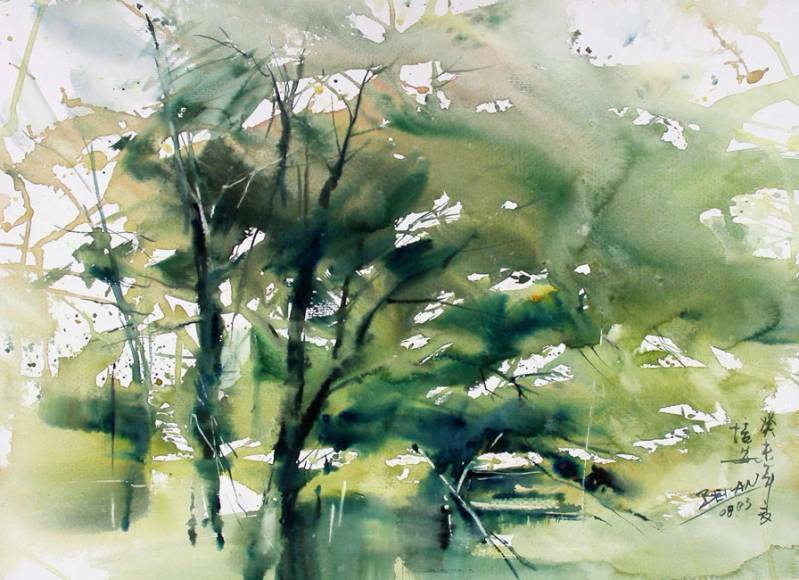 For the course at MD Perrot his recommended materials included Arches 300gm (140lb) paper. 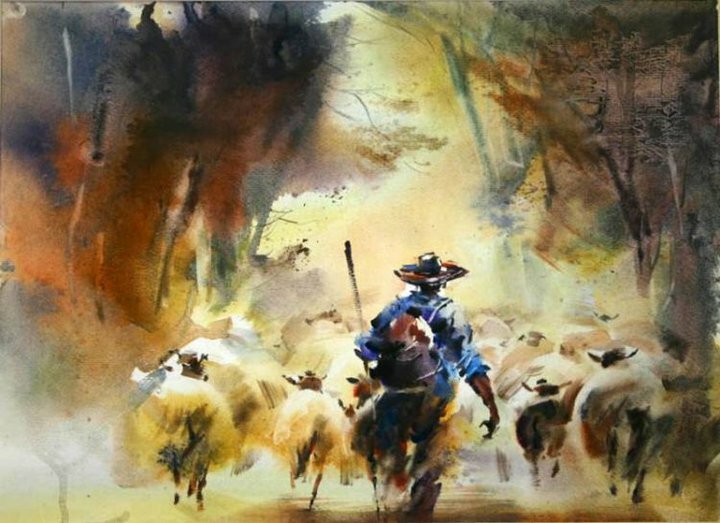 He uses a variety of round and flat brushes and sells them on his courses. 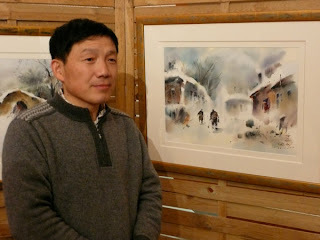 This probably means many are of Chinese origin as he admires Chinese calligraphers and major Asian painters. He is a friend and disciple of the artist Zao Wou ki..
His choice of colours is interesting as he recommends either tubes or a Winsor & Newton box with some additional tubes. The colours given are Lemon Yellow, Gamboge, Orange Yellow, Vermillion Red, Cadmium Red, Permanent Rose, Red Ochre, Alazarin Crimson, Perylene Violet, Dark Violet, Ultramarine Blue, Cerulean Blue, Phalo Blue, Cobalt Blue, Light Green, Dark Green, Burnt Umber, Dark Brown, Ivory Black and white gouache. I don't know if these are all Winsor & Newton as the descriptions- Dark Green, Dark Violet etc - don't exactly match current W & N paints. nevertheless you get the idea - 20 paints in all. 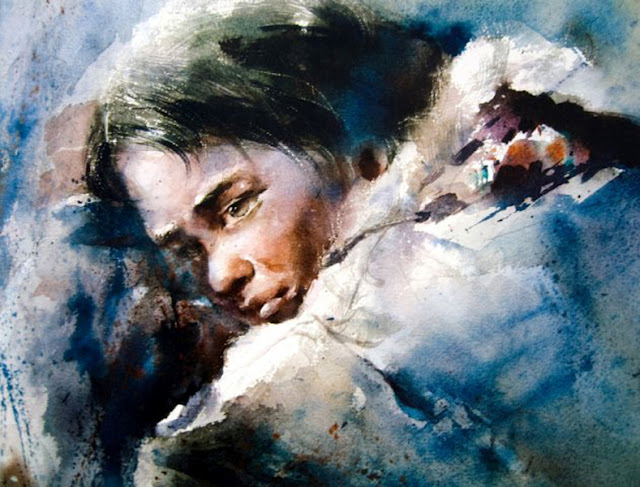 It strikes me that the `limited' palette is not in vogue with an increasing number of artists, principally - but not always - those who paint a range of subjects. Following are a number of examples of his work. 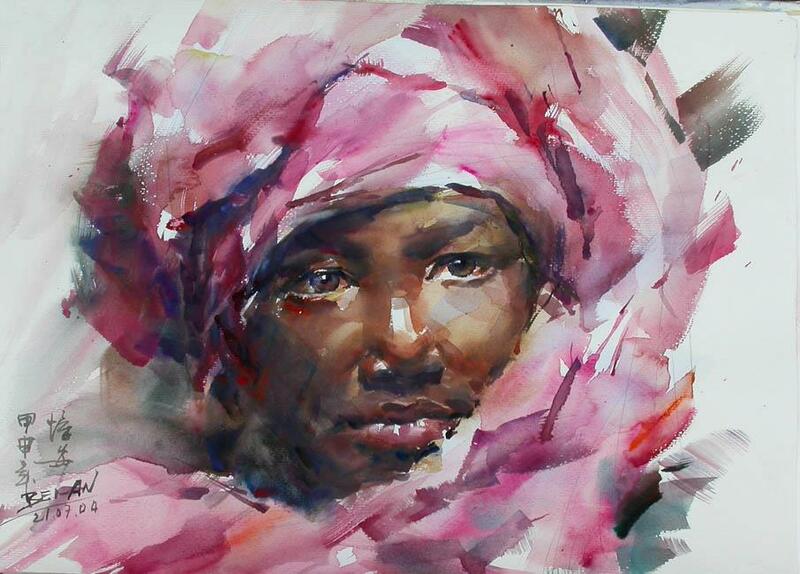 He does portraits which are impressionistic rather than abstract. His other work epitomises the `realistic abstract ' type of painting described and well illustrated in the van Aalst book. This isn't to everyone's taste but I like it very much. I think him a terrific artist and he has a large following. 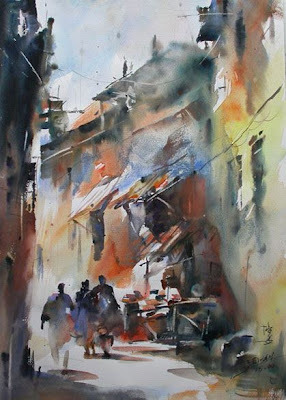 His website is www.caobeian.com/ where you will find a much larger selection of his paintings. Google his name and more comes up. There is one video of his paintings on Youtube, more a catalogue of paintings rather than a demo. PO48 and PO49 are two of the more interesting pigments, transparent and staining, currently offered by a few - very few - paint manufacturers. They are both synthetic pigments classified by Handprint in the `Earth' colours section and rated as `Top Forty' pigments. In the case of PO49 Quinacridone Gold the only source of the actual pigment is Daniel Smith and how long that will continue is a large question mark, as according to Handprint, pigment production ceased years ago, due to lack of demand from the automotive industry. As has been said the paint manufacturers are at the back of the queue, a long way behind the automotive and chemical industries so have to take the scraps!. One or two instances have come to light recently of manufacturers changing the formulation of their paints, yet the packaging and literature have remained unchanged. In other words what you see is not what you get! I wonder how this would play with trading standards? It would be foolish to expect the manufacturers to alter everything for the odd pigment substitution, but is to be hoped this isn't something that becomes widespread. When I have asked questions to at least two manufacturers I received no response. When Quinacridone Gold was originally introduced Winsor & Newton, Sennelier and Daniel Smith all listed it. They still do but, with the exception of Daniel Smith, the current paints are multi-pigment mixes that should correctly be called `hues'. In the case of Maimeri they changed to PY42 without telling anyone and the tubes still say `Quinacridone PV49'. Note PV49 which is and was incorrect and has never been altered. I found the Maimeri version, called Golden Lake, less than satisfactory. The Winsor & Newton Quinacridone Gold was called, by the doyen of Australian watercolour artists Robert Wade, as the `best thing for years'. It was a very nice paint and I still have two original full pans but is now a three pigment mix. I don't have it and while the shade may be similar the results of mixing it with other paints must surely be different. From left to right we have Quinacridone Gold, Quinacridone Rust, Quinacridone Burnt Orange and Gold Ochre. Click on the photo to enlarge it. For more details go to www.handprint.com/HP/WCL/waterfs.html and then to the `Earth' section. I am not entirely happy with these swatches. The first attempt at photographing them turned out too light and using the colour adjustment feature has improved that, but there appears to be more difference between the two PO48 swatches than in actuality. My impression is that the Daniel Smith paint is equally rich if slightly redder. Gold Ochre is a lovely shade but very opaque. The second paint featured is PO48 Quinacridone Orange. Handprint originally said production of this pigment had also been discontinued, but it appears this was untrue and it is currently available from at least three pigment suppliers. It is a lovely colour but the only sources, as far as I am aware, are Daniel Smith, Graham and Da Vinci. Graham call it Quinacridone Rust while the others Quinacridone Burnt Orange. I have both the Daniel Smith and Graham paints and they are one of my favourites. In the UK Daniel Smith paints are available from Jacksons www.jacksonsart.co.uk , Ken Bromley www.artsupplies.co.uk and a few others. Graham and Da Vinci only from Lawrence of Hove www.lawrence.co.uk . In the USA all are freely available. I believe you can get Daniel Smith in Australia but (at a price). Whether any of the European art suppliers stock any of these makes is unknown, although Great Art certainly don't.